Seriously? OMG! WTF?The Princes of England Archives - Seriously? OMG! WTF? Meghan Markle has been changing up things in the British Monarchy and it will be no different for Baby Sussex. 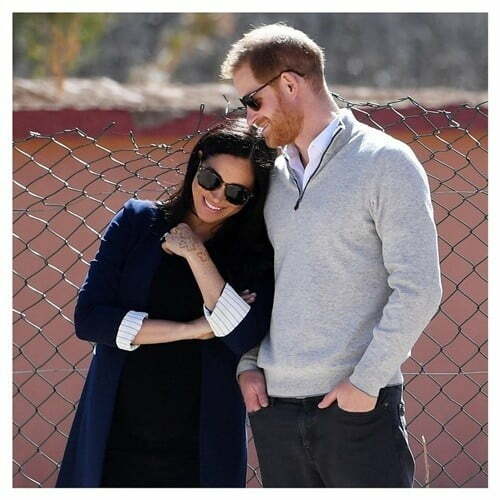 While we will not see Prince Harry and Markle’s baby until it is a few days old, it is expected that the palace will let us know when the duchess is in labor along with a birth announcement when it is born. It will be interesting to see if they will be able to get their request of privacy or if someone will sneak a snap before they are ready. Which might be a little hard because it is not known where she will give birth. Back in 2011, Meghan Markle and Max Greenfield filmed a pilot together for Comedy Central that did not get picked up. A lot has happened since then with the actress now Duchess, and now someone plans on distributing The Boys and Girls Guide to Getting Down. I wonder what he means when he says that they did not connect. Does he mean that they did not become friends? Or that they did not like each other? I am going to go with the latter because that is sexier like this film is supposed to be. Meghan Markle went to Mayhew, an animal welfare charity, today and she met Peggy McEachrom. When the spunky care home resident met the Duchess of Sussex, she said, “You’re a fat lady.” The 6-month pregnant lady said, “I’ll take it.” Good thing she did because, in the olden days, some of the other duchesses would have had her imprisoned on the spot. How much do you want to bet that was probably the first time anyone called the Suits’ star fat. Happy holidays from the Cambridges! Kensington Palace released the Christmas photo of Prince Charles, Kate Middleton and their three children Prince George, Prince Charlotte and Prince Louis and it is perfect. Mostly because it is the most relaxed we have ever seen the Cambridges. That and it is nice to see kids out of their school attire and in jeans. It makes them look like every family Christmas card and not one of royalty. I like it, don’t you? The Royal Baby is already making miracles happen! On Monday, Prince Harry and Meghan Markle announced that they are expecting their first child in the spring. The couple was already in Australia when the news broke. Today the newlyweds visited Dubbo, a town that is experiencing a drought. As soon as they got there, the couple was greeted by a rare downpour according to The Sydney Morning Herald. Is it just a coincidence or did the Royal Baby do it? I am choosing the latter because I think we all need something positive to believe in these days. Another thing I love about their trip to land down under getting some thunder, is that the Duchess of Sussex actually held an umbrella over her husband’s head. Not security, but his wife. More leaders need to be like this couple and be reminded no one is too good to hold their own umbrella.